About Product : ‘Shringaar’ is a woman’s birth right... Shakuntala plucked flowers to make herself garlands, earrings, bangles, hair ornaments and no one could match the beauty of her radiance. There’s something about organic jewels that metal can’t possess; the colors, the simplicity, the softness, the lightness and the fact that they’ll wither away before we do makes them fonder to the heart... and all this is brought to you by this intricately crafted bamboo ornament. According to a myth of a tribe in north-eastern India, all human beings descend on earth with the help of ladders. The material of these ladders varied from person to person. Some descended via gold ladders, while others stepped down through silver ones and then there were the ones who were given Bamboo ladders. As were their paths, so were their worlds; so, the ones who came through bamboo ladders collected together as a clan to live in Tripura. The myth seems to be true as one treads upon bamboo bridges lined over intervening valleys and torrential streams of Tripura and finds the material penetration deep into the lifestyles of the people here. Bamboo and cane are vital parts of social structure here. A wide variety of baskets, pails, rain shields, structural elements, haversacks, accessories and tools are made with the versatile bamboo. Tripura province lies in the eastern frontiers of India, adorning five mountain ranges—Boromura, Atharamura, Longtharai, Shakhan and Jampui Hills. It is the third smallest state of India and connected by only one major highway to the rest of the country. 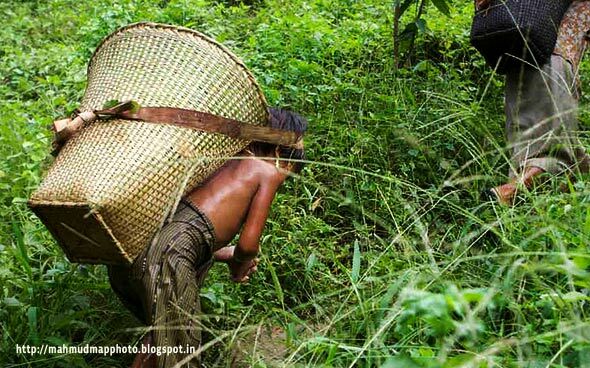 Its terrain and political location has played a key role in conservation of its dense evergreen forests and in sustaining a close knit social structure within its tribes. The region boasts of having the highest number of Primate Species in India. The state is the bowl for bamboo and cane handicrafts in India. Bamboo, wood and cane are used to create an array of furnitures, utensils, hand-held fans, mats, baskets, idols, accessories and interior decoration products. Handicrafts of Agartala (the capital of Tripura) are intricate and painstakingly decorated. They specialize in a wide range of screens, basket, false ceilings, wall panels, plaques and planters, made of gossamer thin bamboo strips. Wall panels are made out of solid but thinly split bamboo pasted on plywood. Containers are made by turning bamboo on a hand lathe. Traditionally, bamboo was also used extensively to construct houses, fences, gates, wall panels, sieves, storage baskets and products for agricultural use. Local entrepreneurs have been combining interesting techniques with finely split bamboo to make new ranges of products; for eg. 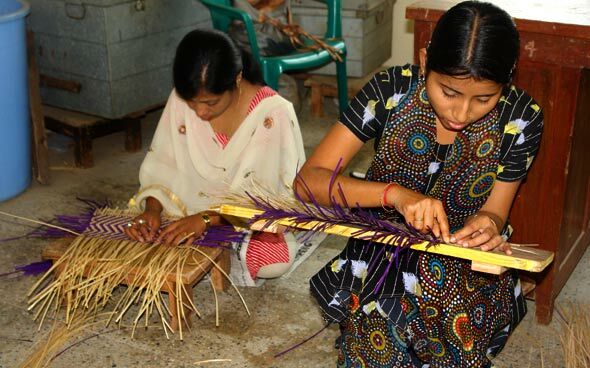 Loom woven mats with thin bamboo strips are a specialty of Agartala, turned and carved cylindrical containers made from bamboo Culm, detail of pokerwork done on shaped bamboo splits that have been strung together to make an umbrella, hand fan made from bamboo mat. The bamboo mats are woven in a warp of red dyed cotton yarn and weft of very finely split bamboo. These mats are popularly used as window blinds and table runners. Craftsmen of Tripura are known to make the finest bamboo splits, which are used as weft and woven into a cotton or polyester warp. The most recent product innovation is the carving of bamboo roots. A number of craftsmen have taken up this work through the offices of the State Handicrafts Development Corporation in Agartala. Many new statues and sculpted narratives are depicted in Bamboo root carvings. 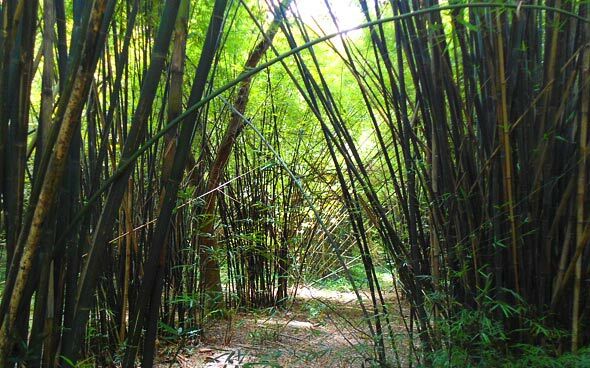 Bamboo is inextricably linked with the culture, beliefs, economy, climate and environment of the state. A wide range of function based bamboo products like fish traps, cattle muzzles, rain shields, sieves and basket for keeping fowl sustain the domestic life of agrarian communities and local conditions which require fishing in shallow waters of the rice fields. 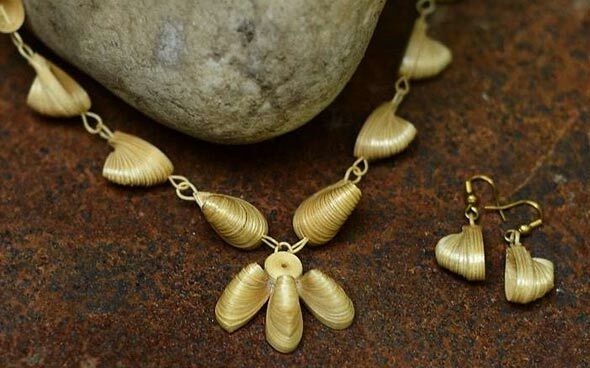 These are made from local species of bamboos that grow in Tripura. 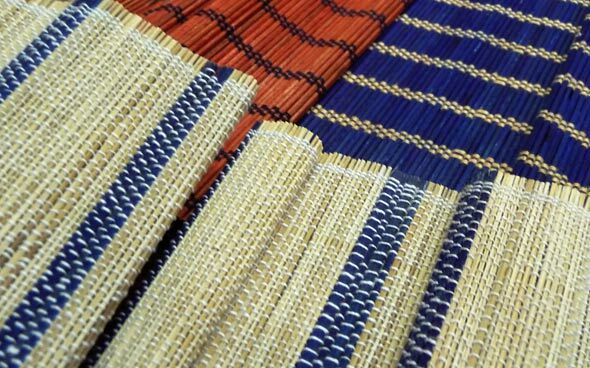 Some products are constructed by interlacing bamboo splits, while others like a fish trap, are shaped from a mat that is first woven as a flat surface. Rain shields are made by sandwiching a layer of dried palm leaves (for waterproofing) between two layers of bamboo strips, interlaced in an open hexagonal weave. The crafts are dependent on the systematic and skillful handling, strength, flexibility and fibrous qualities of bamboo. A large number of culturally distinctive baskets and containers made by the ‘Riang’ and ‘Jamatia’ hill tribes are tall and conical unlike the shallow baskets constructed in the plains. Made from bamboo splits in an open hexagonal and closed weave depending on their function, they are used for carrying and storing grains and other items; for eg. 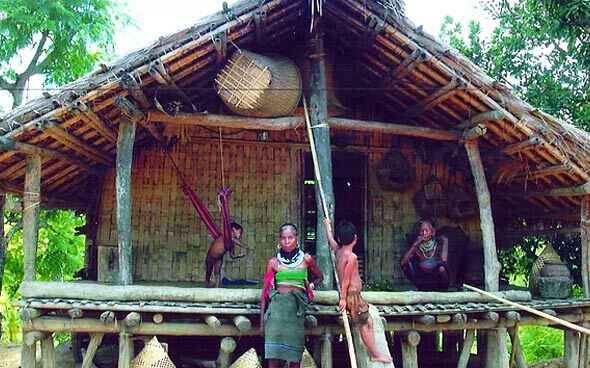 A ‘Jamatia’ open carrying basket is made entirely of outer splits of bamboo, a closed weave bamboo-carrying basket is used for carrying grain by the ‘Riang tribe’. Sides of the baskets are strengthened by bamboo splits. The change in weave from the base towards the top gives the basket a wider mouth. Tukri, shallow storage baskets, ‘Mudha’ (stool) are some other products traditionally made by the tribes. The tribes who made baskets, dalas (vegetable basket), rice keeping containers and the products of everyday use earlier have started using their techniques to make jewelry since 20-25 years. 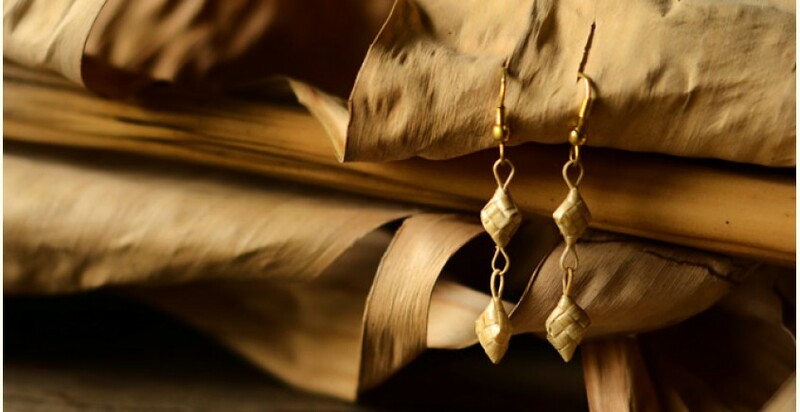 Bet bans (soft bamboo, 1.5 yrs old) is used to make jewelry. Earlier it was used to tie the components to make houses. ‘Takal’, a knife used to split the bamboo in thin pieces and ‘Dao’, a knife with a curved front come handy as the only two tools used in jewelry making. Adhesive to stick elements of the single piece together along with neatly made loops as linkages set the chain complete. Lacquer is used to give luster and waterproofing to the jewelry. An average of a piece a day is made by a single artisan. Another notably interesting fact is that it’s the women folk of the tribe who make these jewelry pieces in their free time from the household duties. Note - The set includes earrings only. -The products in this category are handmade and unique, these might differ slightly from the images shown.